Gameplay itself is 2D only, only small window to see selected units 3D model from fixed camera. 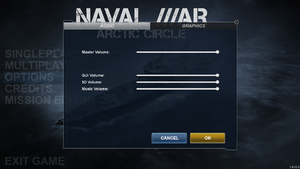 Master, GUI, 3D and Music. The game suffers from sudden unexplained crashes which occur on occasion. There is currently no known fix for this issue. 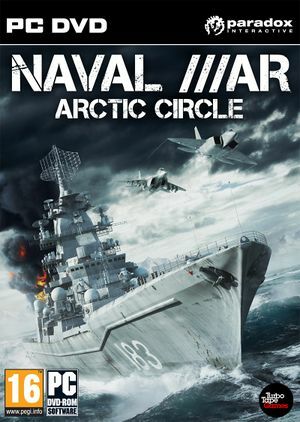 Often when nearing the climax of a mission, or when there are a number of units deployed, the game has been known to perform poorly, slowing down and freezing occasionally, even on high-end systems. There is currently no known fix for this, although the developers are aware of it. When in a lobby, players will often be inexplicably kicked and taken back to the menu when the game begins. The remaining player will then see a dark screen and will be unable to proceed without exiting to the main menu. 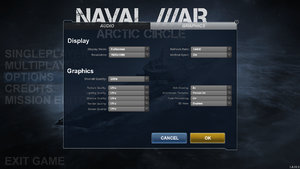 Similarly, Naval War will, on occasion, become unresponsive when in a lobby, and the player will have to end task or Alt+Tab ↹ out and close the game in order to escape. Again, the game has been known to become unresponsive when the host clicks 'Start Game'. There is currently no known fix for these matchmaking issues. The best course of action if a player is experiencing problems is simply to keep re-hosting until successful. Many users who had previously played other Unity engine games (such as Lunar Flight) have reported issues with using the mouse and keyboard in game; notably with regards to zooming in and out. This issue was fixed in v1.0.3.3, so ensure you have updated to the latest version. There is also a manual fix available if patching does not resolve the issue. Integrated graphics cards are not supported. ↑ 2.0 2.1 File/folder structure within this directory reflects the path(s) listed for Windows and/or Steam game data (use Wine regedit to access Windows registry paths). Games with Steam Cloud support may store data in ~/.steam/steam/userdata/<user-id>/200050/ in addition to or instead of this directory. The app ID (200050) may differ in some cases. Treat backslashes as forward slashes. See the glossary page for details.